You could see from our photo gallery the number of shade sail projects we have done in the schools. 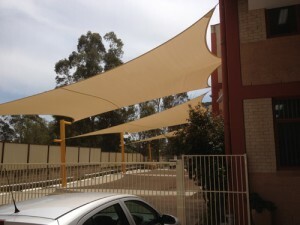 Sails over Basketball courts, Netball courts, general play areas and car parks. Shade sails anchored to steel posts, concrete walls, over steel frames are possible and we will engineer these projects to your specific needs.